Diane Saetern returned to college to advance her career when her sons were just 2 and 7 years old. She's missed countless hours with them in the seven years since, but she hopes the degree she'll earn this month — a bachelor's in criminal justice from CSU Stanislaus — will provide them with lasting inspiration. Saetern, who has worked full time as a Sacramento County caseworker throughout her education, never wavered from her goals, even after losing her father to cancer and nearly losing her home when her husband was laid off during the worst of the economic downturn. "I have been my children's role model when it comes to education and managing responsibilities," Saetern said. "My children have grown to see what goals I have set for myself, as well as the perseverance I have put into attaining those goals." 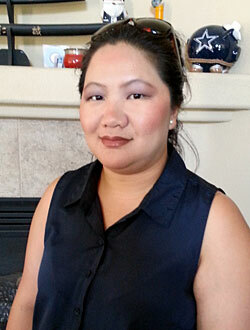 Born in Thailand, Saetern arrived in Sacramento with her family when she was 8 months old. She dropped out of college but returned in 2006, obtaining dual associate's degrees in administration of justice and correctional services at Sacramento City College in 2010. Saetern knew she'd have difficulty finding upper-division courses that fit with her work schedule, but CSU Stanislaus offered a bachelor's degree completion program in criminal justice  that had night classes at the university's Stockton Center  and the flexibility she was looking for. She was also able to land an internship with the Sacramento County Sheriff's Department while a student at CSU Stanislaus — a position she hopes will be the start of a long, successful career in the criminal justice system. "I have been through the worst of the worst, and there were many times when I thought about giving up on my educational goals," Saetern said. "But I managed to keep on going and told myself to never give up, that one day soon I would get there. That day has almost arrived, and I am so proud of what I have been able to accomplish." "Even with all the sacrifices I had to make, I have had the honor and pleasure of meeting a few great individuals in my class. They have become lifelong friends, and together we have had many long, restless nights in this program. We have bonded both inside and outside of our classrooms, and for that, I am very thankful and grateful." "Jeff Kettering and Bernie Licata are both extremely passionate about the courses and information they teach. They are excellent professors who have real-life experiences and training within the criminal justice system. And Chau-Pu Chiang is just one fabulous individual. Not only is she intelligent, but she is raw — she will tell it how it is, and she pushes you to the limit to help you reach your goals." "Never give up, regardless of how difficult things appear to be personally, socially, professionally or within your education. Sometimes in life, you will feel like you have hit rock bottom and you cannot get back up. But if you don't get back up and keep fighting, you will never know what the future may hold for you."